Dodge has become synonymous with sharp performance, towing capabilities, and reliability, whether you need an SUV or sports car. From the Journey and Grand Caravan, to the Charger and Challenger, our new vehicle inventory consists of a wide range of Dodge vehicles—each offering capability and stylishness. Not to mention, the Dodge cars and SUVs are brimming with the latest comforts and technologies, such as Uconnect®, a ParkView® Rear Back Up Camera, and more. Browse our wide selection of new Dodge cars and SUVs below, then contact us to schedule a test drive near Grand Island and Hastings! 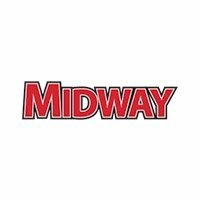 Shop New Dodge Vehicles at Midway Auto Dealerships! Looking for a great deal on a new Dodge? Be sure to browse our new vehicle specials before you schedule your test drive near Holdrege! Our finance team can answer any questions you may have about our specials, and help you apply for financing, so you can drive home in the new Dodge you’ve always wanted.